The Highland Pony has been and remains, one of the truest British native types. The breed has a long recorded history and proven pedigrees that date back to the 1880's. Two hundred years ago it was the universal workhorse throughout the highlands and islands of Scotland, and even in the borders of Scotland where it had a close affinity with the now extinct Galloway. Because of the isolation of the highland glens and islands in the 18th and 19th centuries many sub-types arose, such as the Islay, Rhum, Mull and Barra strains, and it is also apparent that the Eriskay was also regarded as a Gocon(Gaelic - Lark) or lighter type of Highland Pony like the closely related Barra and Mull Gocans. Queen Victoria started the long association of the Royal Family with the breed which continues today with Her Majesty. The Queen's personal interest was in the breeding and showing of Highland Ponies and her patronage of the Society. At the same time many other large landowners kept large studs of pure bred Highland Ponies, one of the most famous being the Duke of Atholl's Stud. Many of these early ponies grew to 15.2 h.h., and it was it later that the N.P.S (The National Pony Society) set the height limit at 14.2 h.h. However the large ponies continued to be in great demand for military purpose by the Scottish Horse and the Lovat Scouts. In the 1890's the Department of Agriculture for Scotland, founded the 'Faillie' Stud in Skye to improve Highland Ponies for agricultural purposes. This stud moved to Inverness in 1913 and changed it's name to Knocknagael. Many prepotent sires were bred from this stud until it's closure and sale, due to Government cuts - after a vigorous campaign to save it - in December 1977. Although this was a blow to the Society, the stock then offered was all bought by members and continued to be used to great effect in preserving quality in the breed. 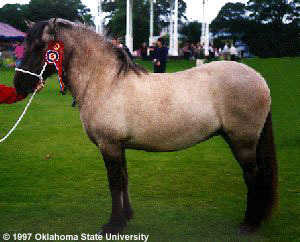 The Society did not sectionalize the Stud Book, and breeders could breed freely from registered ponies to select the type for whatever use or market they were supplying. 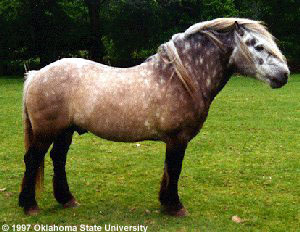 This has given rise to forthright views about what a Highland Pony should look like, and also has resulted in a wide range of type and size in any native breed (i.e, 13 h.h. - 14.2 h.h.). Breeders of Highland Ponies still have an on-going role for their ponies, for deer forests, trekking, agriculture, driving, endurance riding and other recreational pursuits. Ponies are still bred for bone and substance but the main departure in recent years is the selection of good strong active animals for riding and driving. This process is a continuing one and is being used with existing bloodlines. Nevertheless, there is a growing realization that using a Highland Pony is an excellent way to improve the substance and temperament and of course with the Thoroughbred as the first stage in the production of second and third cross event horses. 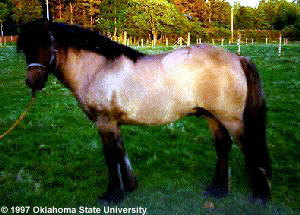 The Highland Pony supplying excellent bone structure and also imparting native intelligence and temperament.